What do we know about teaching vocabulary? There are plenty of effective ways to teach vocabulary and one truly useless approach that is used far too often. We know from years of research that assigning lists of unrelated words to be learned using the dictionary is pretty much a waste of everybody’s time (Beck, McKeown & Kucan, 2013). Context and a student-friendly definition are considered to be two important elements of teaching new words. Also, in order for us to make a word our own, we need multiple exposures to the word in different contexts. 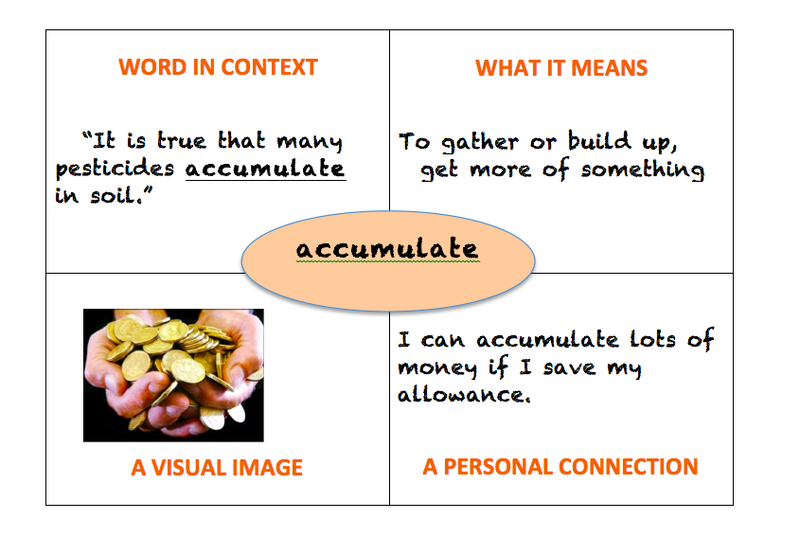 Vocabulary Squares, based on the classic Frayer Chart, ask learners to record a key word in context, provide a definition, generate an image related to the word and identify a personal connection to remember the word. Click here or on the image on the right to download a Vocabulary Squares graphic organizer. Also, visit the HIP TIPS Archives for Michael Graves’s Four-Part Instructional Model.